Banh khot is thought to be the closest relative of banh xeo and in Southern Vietnam, there are so many restaurants serving banh xeo and banh khot as a pair. While banh xeo is fried onto a large pan, banh khot is cooked in small round molds. Its batter is a combination of mostly rice flour, and even leftover grains of rice, mung beans, pork, shallots, mixed together with coconut milk to make it extra rich and creamy, and with a hint of turmeric to give them an attractive yellow tinge. Finally, the cook usually adds diced up green onions and shrimp, and in this case, extra coconut milk on top. Banh khot is a famous Vietnamese dish of miniature pancakes served with fresh herbs and leafy green vegetables and spicy sweet fish dipping sauce. Let’s enjoy Vietnamese banh khot if you love crispy savory pancakes! Banh khot is called a little gem among the list of endless delicious Vietnamese snacks and light meals. No matter how many ways this cake could be translated, from kettle cakes, to coconut rice cakes, to crispy savory pancakes, it is just delicious bite sized treats. Actually, banh can is the Mekong Delta’s bank khot without coconut milk and turmeric. 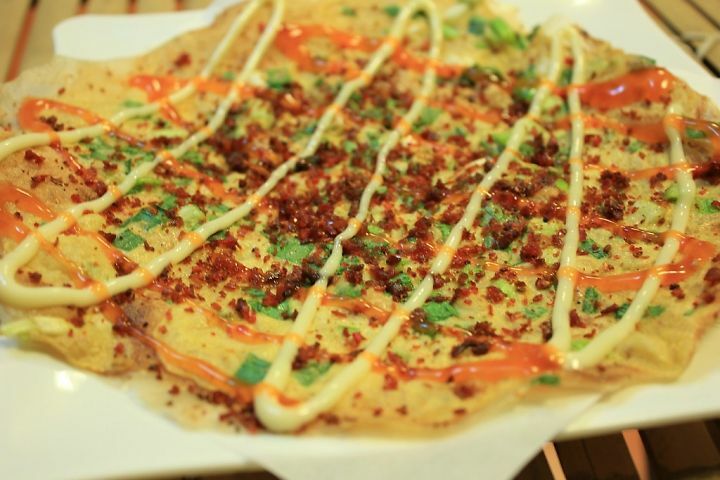 Originally coming from the Cham people in Ninh Thuan Province, this little rice pancake has gradually become a specialty of Southern Central Vietnam. 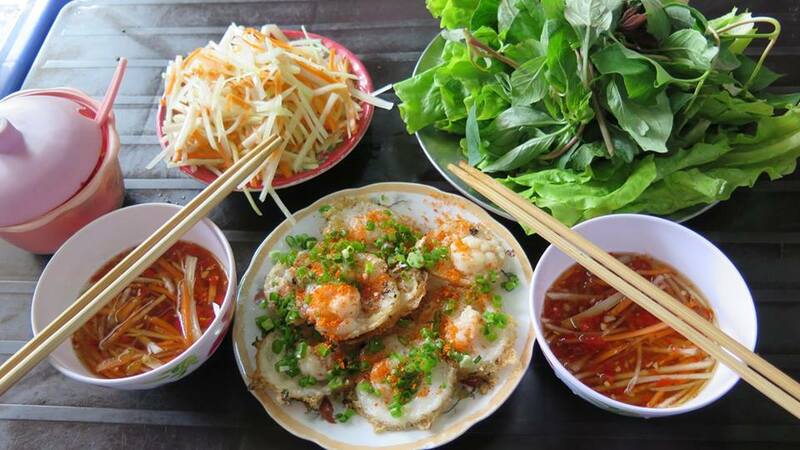 It is possible to find the best banh can either in Phu Yen, Ninh Thuan or Binh Thuan, and it is also highly recommended to try banh can in the Central Highland resort town of Dalat. In Ninh Thuan and its neighbors, banh can is served with a bowl of sauce made from braising fish, onions and pickles. Meanwhile, banh can in Dalat is served with fish sauce, ground meat balls and fried shallots. Looked from outside, the golden half-folded banh khoai is a thicker, tinier and crunchier banh xeo. When searching for banh xeo in Vietnamese Wikipedia, you can see a section about banh khoai as well. 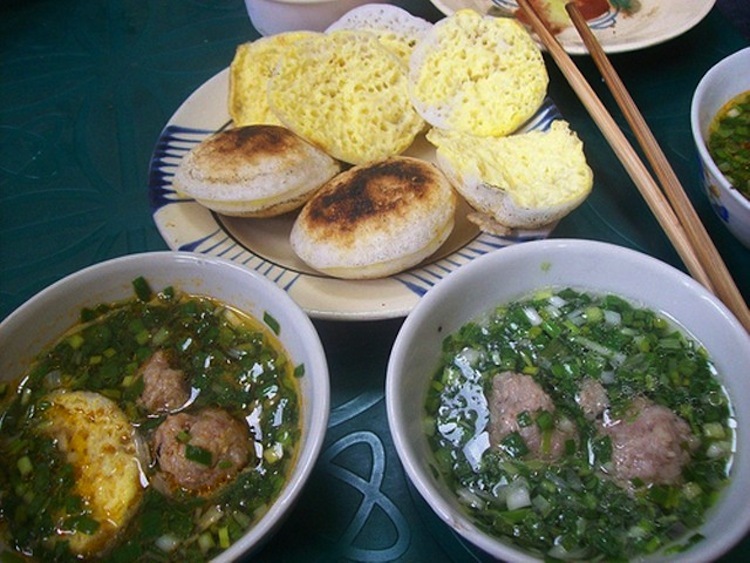 Banh khoai is a specialty of Central Vietnam’s cuisine, and Hue cuisine is said to offer a great one. 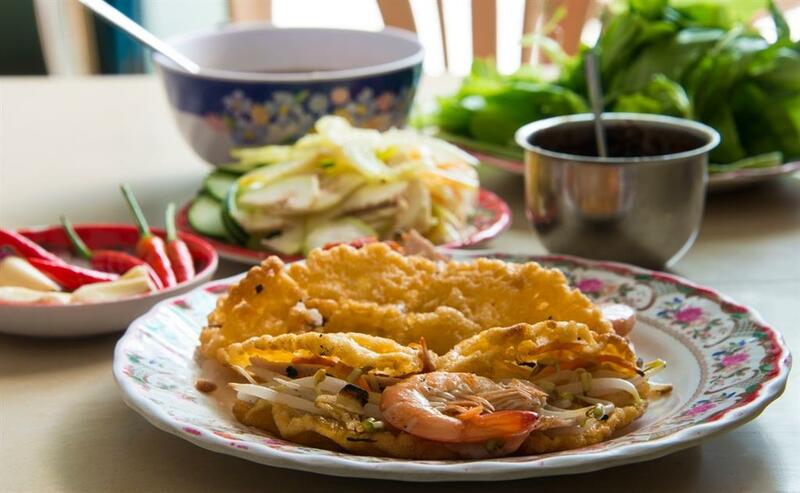 On Dinh Tien Hoang Street near Thuong Tu Gate to the southeast of the Imperial City, a family restaurant with more than 40 years experience is the best place to enjoy this dish. It is best to enjoy banh khoai with peanut and soybean sauce, which also has the juice from fermented shrimp paste, pork and sesame. 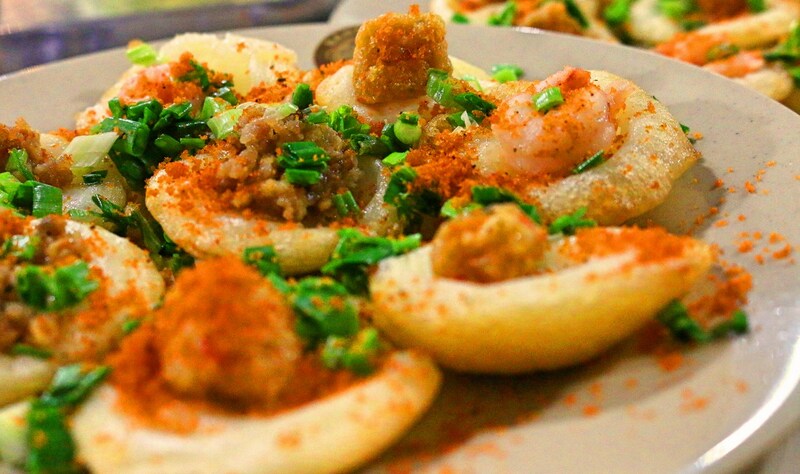 First appeared in Hanoi in the 1970s, banh tom (shrimp cake) has since become a foody icon of Hanoi capital city. Anytime talking about banh tom, almost everyone will immediately think about West Lake, the famous venue for the deep-fried rice powder cake with tom (shrimp). To keep it crispy for long time, Hanoians also add into the authentic West Lake cakes some pieces of sweet potato. Like shrimp cake, the banh xeo version of Dalat is actually a distant relative of banh xeo. Banh trang nuong is rice paper with toppings such as dried beef, egg, mayonnaise, cheese and shallots grilled until really crispy. 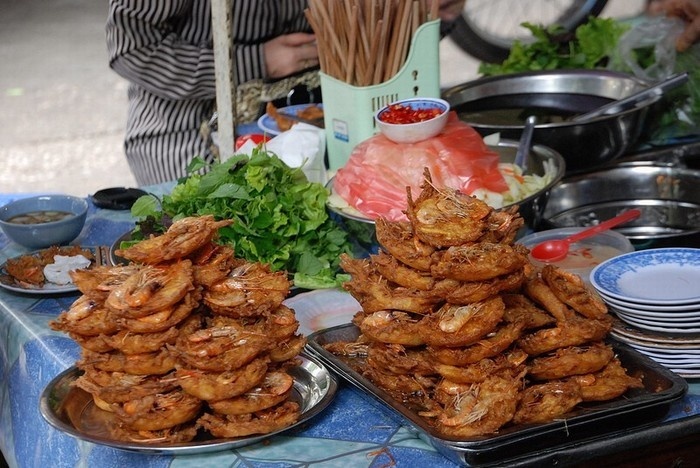 It is said that the snack has been invented in Dalat before gaining its nationwide popularity in recent years, and having become a favorite street food in Ho Chi Minh City. You can find the best banh trang nuong at this little yet always crowded diner at No 180 Bui Thi Xuan Street, Tan Binh District.